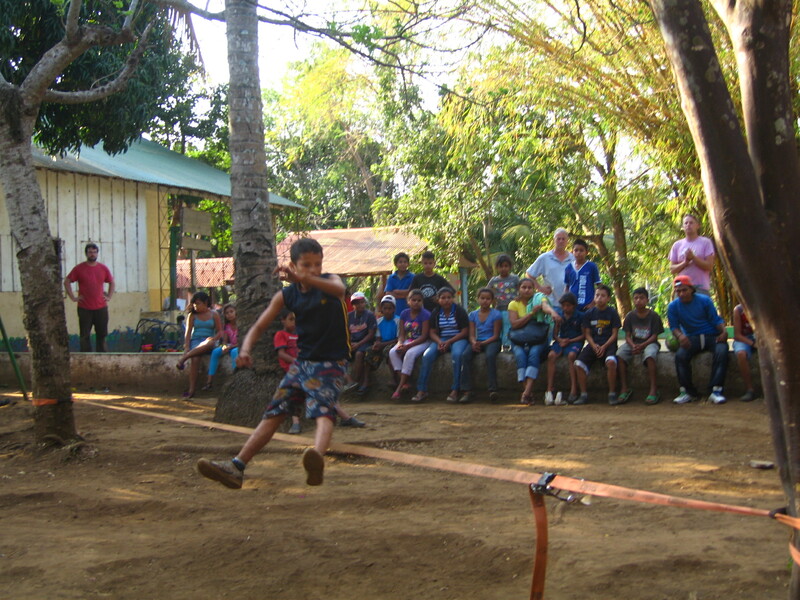 We’ve been in San Marcos for about three weeks teaching circus to a group of kids from an organisation called Los Quinchos who work with street kids from Managua. Their skills are developing incredibly fast. We taught at the Boys’ farm today and I watched Jake show a kid a trick on a slackline called a seat drop. The kid then practiced it and an hour later he successfully performed it on his third attempt in front of all his friends. His enthusiasm for practicing the trick relentlessly and then the massive grin on his face when he performed it makes me think he feels the same way about circus as I do. 1. Provides a fun, motivating and intrinsically reinforcing experience. 2. Increases positive risk taking both physically and emotionally, in a safe and supported environment. 3. Promotes physical health and body awareness through activity. 4. 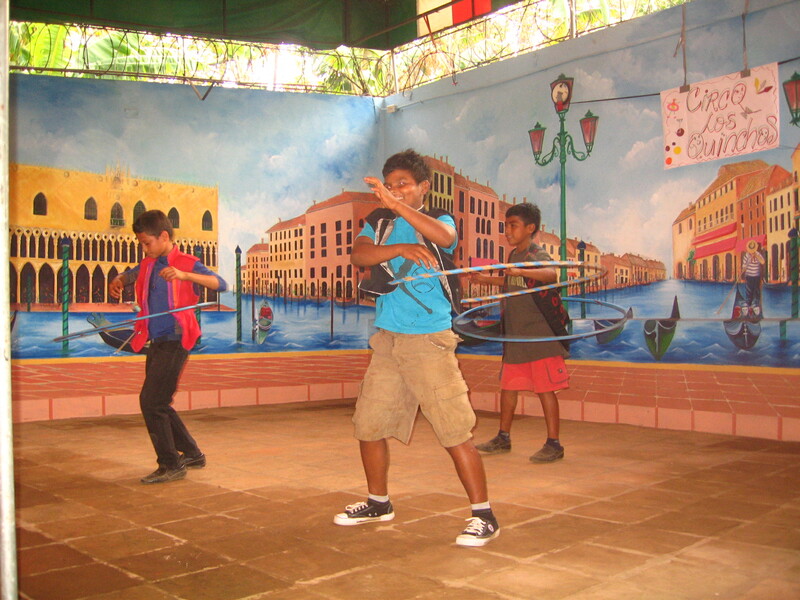 Enables participants to acquire a broadened skill base relating to circus as well as more generic ‘life skills’. 5. Increases self-confidence and self-efficacy. 6. Improves social connectedness, teamwork, and leadership skills within the group. 7. Provides opportunities for calming rhythmic activities, increased sensory feedback, a focus on balance, and coordination. 8. Creates a space in which participants feel a sense of belonging. Performers Without Borders has a number of goals in mind when we’re doing these sorts of projects. Firstly we’re attempting to give vulnerable children the opportunity to explore their potential in a safe environment. We’re hoping they’re going to get many of the benefits that are outlined above thus improving how the children see themselves and their place in the community. Also the project has to be sustainable. We’re not just going to teach them circus and then leave. We provide them with circus kit and try to create an environment where they will continue to develop their circus skills and hopefully teach them to others. Each year a team will come back, check on their progress and top-up their skills. I would recommend doing this sort of project to anyone. It is immeasurably rewarding to be involved in and I know I will be talking about all the happy memories I have from working with these incredible children for years to come. Paradox is the first word in mind when I think of this India experience. Everything in India seems to have 2 extreme opposites, my heart and brain feel many times torn and confused because of that. On one side there is this beautiful and friendly India with its amazing colours, traditions, smiles, nature, food, aromas and hard working people. On the other side there is the polluted, rough, loud, smelly, lazy and superstitious India where everything is possible and I am many times amazed with their creative problem solving. Above all that, there are the thousands of western hippies trying to ‘find’ themselves but in my eyes it is not always sure if they find their ‘self’ or actually loosing themselves. Also there are amazing and inspiring volunteer projects with sponsors from all over the world and we are one of them! My mind, ears, eyes and nose are working over time here in Varanasi. It is a lovely adventure biking to Ashadeep school our main project in Varanasi. With 1 or 2 students on the back of the bike, mastering the bmx-track road, we weave through rikshaws, motorbikes, dogs, goats and gangs of huge buffalo’s. I am happy to arrive alive at the school near Nagwa, even though completely sweaty. Then it all starts…….. Gola banou we all scream and the children start to come in the circle for the daily warm up. Slowly more and more children are coming into our circle in the big outside space on the ganges. After the warm up it is time for games to make some fun together. The children are already very anxious to start practicing their favourite toys. After the games the circus begins……. Diabolo, ribbon, flower stick, hula hoop, spinning plates, dance, juggling, staff, clowning, yoyo, poi and unicycles are all in the space to practice and to have fun with. Some children already worked with PWB for some years and know what toys they like and go for it. Other children are still exploring and trying. They try several toys and find what toys they like or what they are good at. As soon as they have found that joy it is amazing to watch the smiles on their faces. Didi, Ankedidi, Bhia, Andybhia, Chezdidi didi didi didi it sounds through the space as they all scream as loud as possible to get our attention to show us their new learned trick. It is heart warming to see their proud faces after looking at them and saying acha (Good). For the children who want to specialise more in a discipline and would like to perform it at the end of the project in Assi Ghat, there are more specialised workshops. I personally made a ribbon dance choreography that the girls really love, I also support Livi in the hula hoop workshop. This way I mostly work with the girls and now in this 3rd week I really start to feel a connection with them. I finally start to remember some names it is not an easy task with all these difficult Indian names. It is nice to get the know them better and discover their story. It was great to be invited into a home of one of the girls’ and be introduced to all her family. They live in one room with all the family and sleep all together in one bed. There is no privacy and the girls have to help with cooking and cleaning after school time. The girls love my attention and I love giving it to them. Wow wow wow we have discovered some true talents here….. it is unbelievable! The older kids who have worked with PWB before clearly have practiced a lot all year through because they know some amazing tricks. The kids here are very physically orientated and it makes them very quick learners. The children are used to learning with a ‘follow-the-leader’ style so they follow every movement and noise you make when you are teaching. This sometimes gives hilarious moments but also incredible moments if they just copy a move immediately that you have practised for weeks. All eight of us have been working with little groups of children on different disciplines to perform in the show in Assi Ghat. We all worked really intensely with our little groups and I am very much looking forward to the show on Monday 25-3-13. We will see all the talents in one big show ending with fire! It is once again amazing to see the older boys with fire staff, fire poi and fire juggling. The girls dance gracefully with fire fans and fire hoop. Even there are some younger kids who are not afraid and show us some amazing fire tricks. The 2nd project we have been working with is the Dutch Funded Duniya. A little school with very polite and friendly children. Though the space is very small we managed to give some great workshops. We were very well looked after with chai and food between a few bricked walls that created this school. The children really enjoyed flower stick, ribbon, dance, scarves, diablo, poi and beatboxing. The teachers were very involved with the project, this made working there a real joy. I really enjoyed going out with one of the teachers on a scooter through Varanasi to shop for a real Indian dress. 8 people, 1 apartment…. what to say about that, lol! We all get along very well and trying to deal with this whole experience together. Every single one of us is following our own learning curve. Of course we all learn a lot about teaching as the children here are very challenging. But also we are learning a lot from each other. Dealing with 8 people with all their own emotions and habits is not always easy, so it makes you aware of your place and part in a social group. India can be very confronting so we are also all dealing with our personal feelings towards the world. The kitchen has been a very creative place and we have been enjoying cooking very healthy and tastefully for each other. Dinner is a social moment where we all get to hang out together and talk about the happenings of the day. Carlos’ desert has been everybody’s favourite and we will all miss it a lot when he will unfortunately leave us after Varanasi. I want to thank Carlos for bringing a lot of fun and ‘no worries’ to the group. Your ‘Spanishness’ has brought a lot of charming and hilarious moments and it was a pleasure to work with you. Next week I am going to Both Gaya and Sikim with Abi and Chez for a mini holiday. After we will meet up with the rest of the team in epic and cooler Darjeeling. Thanks to all the sponsors to make this journey possible, wish you could all be here to see the smiles that circus can bring in children’s lives! Choo Choo. Scuttle, scrap, bang, crash, wallop. Thud. PWB India arrives in Varanasi- Holiest to all Hindus. Contrasting to Kolkata. Winding streets, alleyways, dusty nooks and crusty corners. Oldest of inhabited cities; names from Kashi – the ‘City of Life’, Banares to Varanasi they all ripple off the tongue. The rituals of death played within the ebbs and flows of life. Cows lazily grazing alongside riverbeds, buffalos plodding into muddy puddles. The city of the Ganges, washing on and off the grime of life, candles and ashes floating among the ripples. 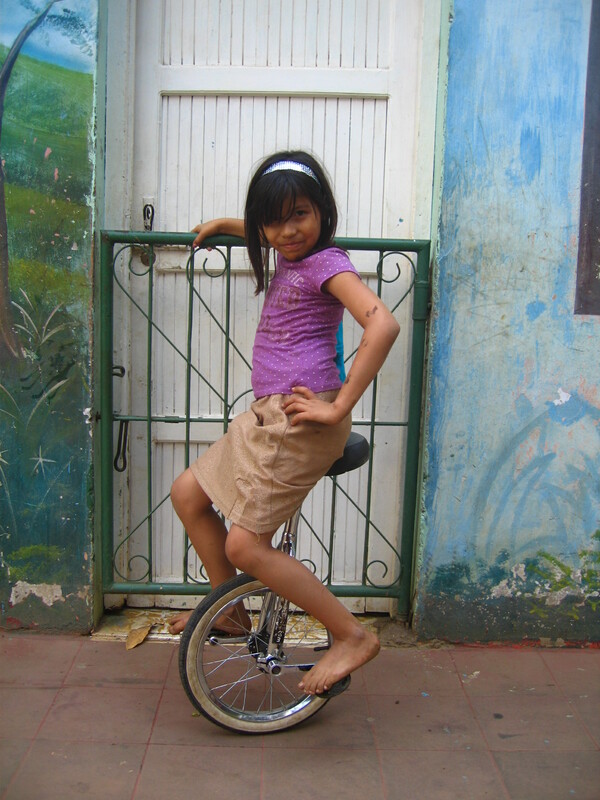 Children scuttle amongst the tinkling wake of bicycles, unicycles- here comes the circus! The molten sun goes down, celebrated by singing and fire. The weary-lidded joy-makers return to the serenity and comfort of home cooking, only ever a door away from the medleys- “woof woof”, “ommmm”, “beep beep”, “moooooo”, “hari hari Krishna”! You are currently browsing the Performers Without Borders blog archives for March, 2013.